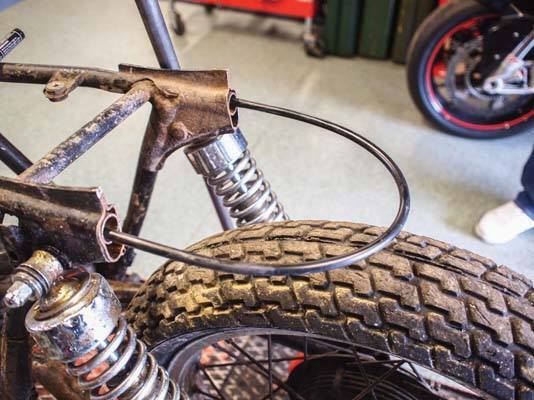 Yamaha SR500 project bike, chapter three. Contrary to popular belief, welding was invented by Waldo E Lding back in 1921. Waldo was a butcher and one evening, while vigorously sharpening a knife in his basement, he stood on the plug for his Scalextric (the Metro 6R4 one), ran a current through his body and up the knife, fusing it to the sharpening rod. When his wife had finished dousing the flames on his charred body, she patented the idea and had it off in the welding market. Eventually she traded the patent for a new washing machine and some pretty buttons, but by then she’d flooded the market and made her millions. Welding became less popular after Velcro was invented and nowadays, nobody really does it. Until now. 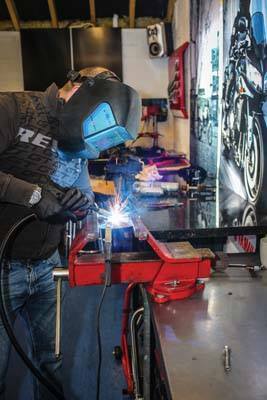 In a bid to do all of the work on the SR myself, it became apparent that as well as cutting loads of bits off, I’d also need to weld some bits back onto the frame of the SR. The most major of these small pieces to do was the shortened rear subframe. I’ve watched a million Youtube videos about welding, plus my older brother was a welder in the army, I convinced myself that was enough, so I set up the kit like a pro. What followed can only really be described as the most pointless waste of a grown man’s time since the invention of the Super Nintendo. 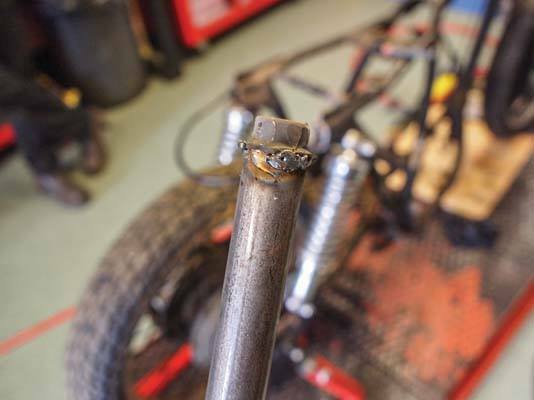 The plan was simple, weld a bolt into the end of a steel tube, then stick the head of the bolt into the frame rail on the bike and run a line of weld around that. Bosh. I’ve never welded before, can you tell? Things started pretty well, I didn’t spill any of the milk and I remembered how many sugars everyone in the workshop wanted, but it was downhill from then until home time. No matter how close or far away I held the rod, how fast or slow I fed it along the metal, every single attempt ended up looking like a little map of Cyprus. 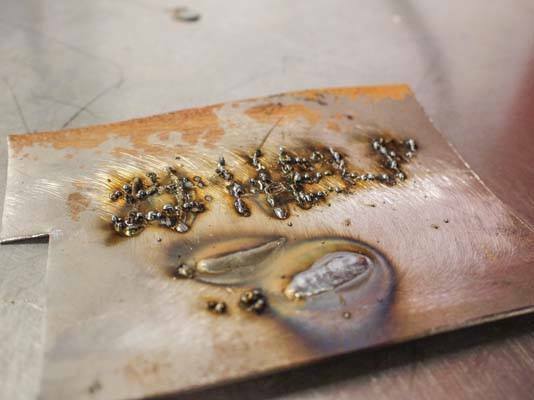 In short, I’m not a welder. I did what all good welders do when they’re under pressure and put the welder away. I focused instead on some free flow metal bending and tried to turn the straight metal tube with the little map of Cyprus on the end, into the U shaped piece of metal that would become my subframe. How hard could this be? I hunted around the workshop for something with the required radius, in the end it turned out to be an exhaust off a Piaggio X7 scooter. With it firmly in the clamp, we set to work with a blowtorch. When it was cherry red, I’d push it around the X7 exhaust and everyone in the workshop would marvel at my ingenuity. When the boys finished laughing at my new really heavy boomerang, one with a crimped flat middle that hissed when I spat on it, I was forced onto the Internet to look for some local help. 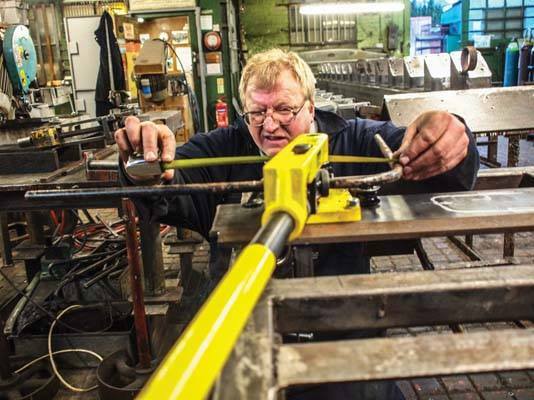 I ended up in Thornton Heath, in Martin Bissex’s family-owned workshop. When in doubt, ask a grown up.